When you travel internationally, you learn to adapt to your environment. But when you are traveling internationally with a baby or toddler, who hasn’t yet learned how to adapt to change, you come to appreciate the small things. At times, you miss those comforts from home that make life easier. Changing tables, playgrounds, high chairs, cribs, and bath tubs are all conveniences you can’t always expect when traveling with babies and toddlers abroad. In the United States, families who travel have it fairly easy. Businesses, hotels, and restaurants all provide a variety of conveniences that I realize I’ve taken for granted over the last few years. Although I’m fairly certain there isn’t a shortage of babies and toddlers in other countries, many places around the world simply do not cater to families traveling with children the way the United States does. Hotels will have everything your little ones need in the USA. Cribs are almost universally provided, albeit they are a bit weird sometimes. There are convenience stores everywhere that sell disposable diapers, baby wipes, milk, medicine, and other essentials. Sure, you’ll pay a bit more at a convenience store, but that’s because you are paying for convenience. You can save a few bucks by hitting up a grocery store or large retailer instead. As an American, I am a bit spoiled when traveling within my own country. 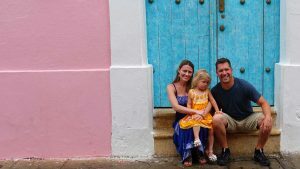 The main challenges I’ve faced traveling with our daughter have been when we were in another country. 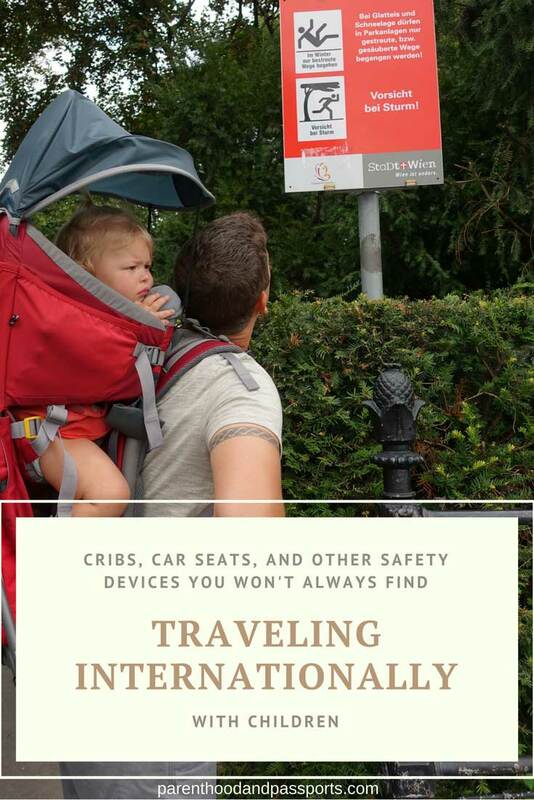 Although traveling internationally with a baby or toddler isn’t always difficult, you likely won’t find the same level of convenience that you have in the United States. 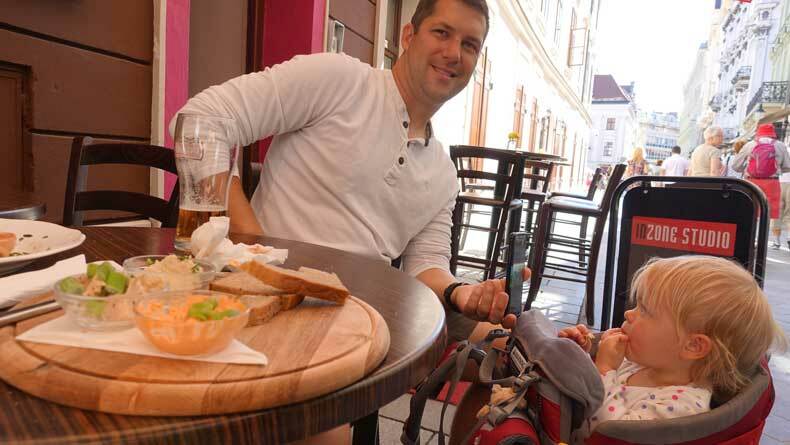 One of the most noticeable differences between traveling in the states and traveling internationally with a baby or toddler is the lack of changing tables abroad. 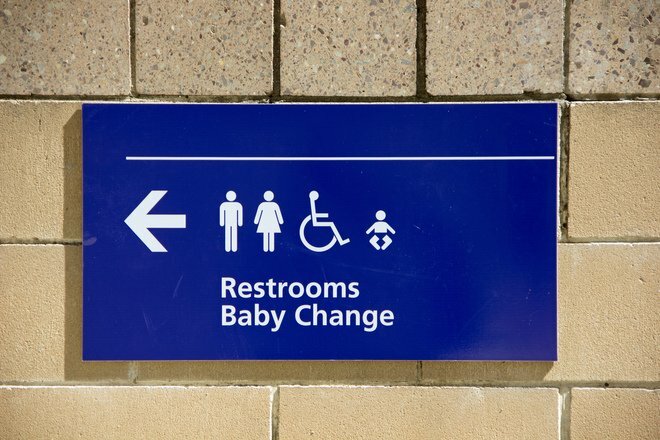 Changing tables are in almost all bathrooms in the states, including the men’s restrooms. (Shout out to all the dads out there changing diapers!) In many establishments, there are even special bathrooms reserved for families. But in other parts of the world changing tables aren’t as common. In fact, we struggled to find a single changing table anywhere in Europe or Central America. This was most surprising to me in Europe, considering it is one of the most developed continents in the world and is a tourism hub. I’m genuinely curious what parents do in other countries if their non-potty trained baby or toddler decides to drop a diaper load while out in public. When we were dining at a restaurant in Prague last fall, this exact thing happened. There was no changing table in the bathroom, so I asked a hostess where I could change my daughter’s diaper. She pointed to an empty booth. The idea of changing my daughter in the middle of the restaurant seemed a bit discourteous to other diners. But letting my daughter sit in a soiled diaper seemed rather discourteous to her. So I hurriedly made the change and tossed the soiled diaper in the bathroom trash can. Luckily, there were very few people in the restaurant, and those who were in there, were nowhere near the empty booth. In Central America, many of the restaurants didn’t even have booths, so I laid my squirmy, confused child across my lap while sitting on a toilet and changed her that way. Also not ideal, and quite complicated I might add, but when you have a kid you do what you’ve got to do. There are definitely international destinations that are an exception to this. We found Japan to be very child-friendly and accommodating to even the tiniest of travelers. But for the most part, bathrooms abroad are not always equipped for families with young children. If you’re traveling with a potty-trained toddler, you probably don’t miss the days of changing tables at all. But in many parts of the world you may run into another issue. In the United States, you can walk into basically any establishment and find a public restroom. But in some countries, particularly in Europe, public bathrooms require you to pay a small fee to use them. The fee is cash only, so make sure you have some change in whatever currency the country uses to pay for the emergency potty moments for your toddler. Another public restroom issue you may run into when traveling internationally with a baby or toddler is the difference in toilets. In China, for example, many of the places we went only had squat toilets. This can be intimidating for adults who have only ever used a western toilet. So imagine trying to convince a toddler, who is still getting the hang of using a toilet, to squat over a porcelain hole in the ground and go number 2. High chairs are more readily available abroad than changing tables, although at times their safety standards are questionable. Still, there are a lot of restaurants that do not offer them. We’ve found a way around the high chair issue. Now that our daughter is old enough to be worn in a framed child carrier, we don’t leave home without it, and it serves multiple purposes! When in restaurants or cafes that do not offer high chairs, we often leave her sitting in the carrier during meal time. It has a kick stand that keeps it from tipping over, and she actually enjoys being in it more than she does a high chair, although it does sit lower to the ground than a traditional chair. The other option, and the one we most often opt for, is eating on the go. Who needs a high chair when you have awesome street food and a park where your toddler can roam freely? This is our go-to dining style right now since our 2-year-old doesn’t like to sit still very long. We’ve yet to visit a country that didn’t offer cribs. There are plenty of hotels, and particularly hostels, that do not have cribs do to the size of the room or the type of traveler they cater to. But any hotel that is used to hosting the occasional family will usually have a crib on hand. I’ve actually been most impressed with cribs in Europe. Every hotel in which we’ve stayed across numerous European countries provided very nice pack n plays. European pack n plays are longer than the ones found in the states. 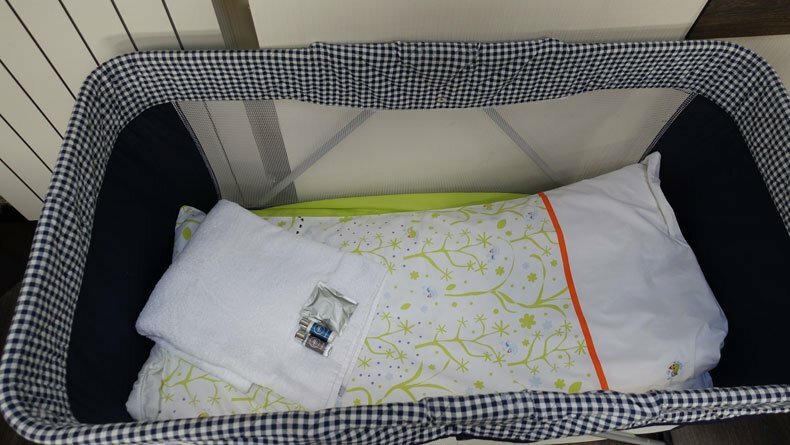 They come with an actual crib mattress, sheets and a fluffy duvet set with a toddler-sized pillow. Some cribs we’ve been provided have even come with impressive stuffed animals. In other parts of the world, the cribs or pack n plays have been more basic, but they have mostly been acceptable. I always bring my own sheet from home, just to make the hotel feel a little more familiar for our daughter. 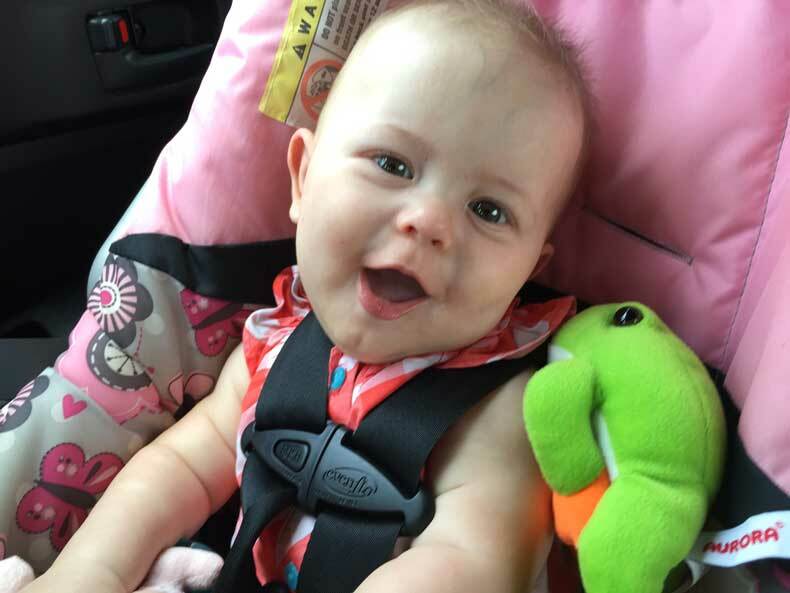 Car seat laws differ greatly from country to country. Many countries don’t require car seats for children. In fact, child passenger safety laws are practically nonexistent in some parts of the world. In lesser developed countries, for example, it isn’t uncommon or illegal to see babies on motorcycles with three or four other people cruising down the highway. Still for the safety conscious parent traveling internationally with a baby or toddler, most car rental agencies have car seats available for families who are renting or hiring a car, even if a car seat isn’t required by law. I’ll admit, sometimes those car seats aren’t in the greatest condition and aren’t the cleanest, so if you can, I always recommend bringing a car seat with you. For kids who are a little older, there are portable car seats and portable boosters you can buy that are perfect for traveling. In the United States, we take safety seriously. Every building or attraction has to pass a stringent safety inspection. Doors have to be a certain width, staircases must have railings, and caution signs are plastered anywhere you could possibly imagine getting hurt. That will not be the case everywhere you go. Don’t expect the same safety standards abroad as we have in the states. We’ve been to attractions where the staircase was so unstable that we had to turn around because it wasn’t safe for a baby or toddler. With more lenient safety standards, always use extra precaution and watch your child more carefully. Playgrounds are always fun to visit in other countries. In Europe, we had no problem finding an adequate playground. We found them at truck stops, in restaurants and beer gardens, and sprinkled throughout every city we visited. In other parts of the world, like Central America or Southeast Asia, you probably will have a difficult time finding a well maintained playground, but there are still plenty of outdoor places for kids to play. When traveling with babies and toddlers, playgrounds are great! It gives your child a chance to be a kid, to take a break from sightseeing, and to make new friends and develop their social skills. 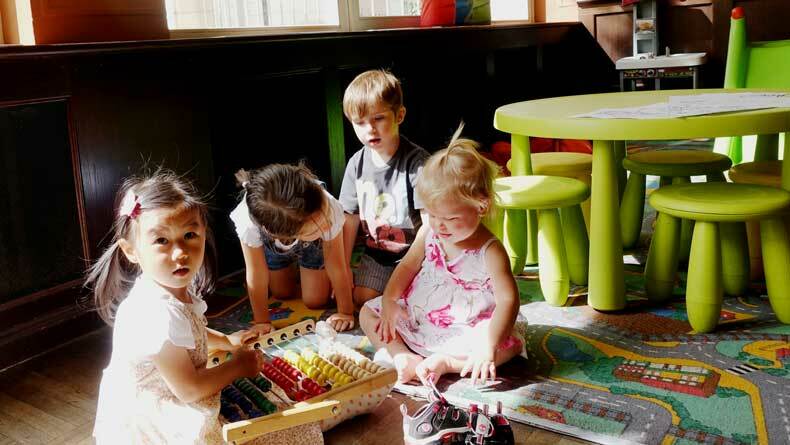 Kids don’t need to speak the same language to make friends. In fact, in the picture below, not a single kid spoke the same language, but it didn’t stop them from having fun together. It’s beautiful really to see how accepting kids are of others. Children are more inclined to see similarities instead of differences in each other. I wish more adults were that way. We can learn a lot from traveling with babies and toddlers. 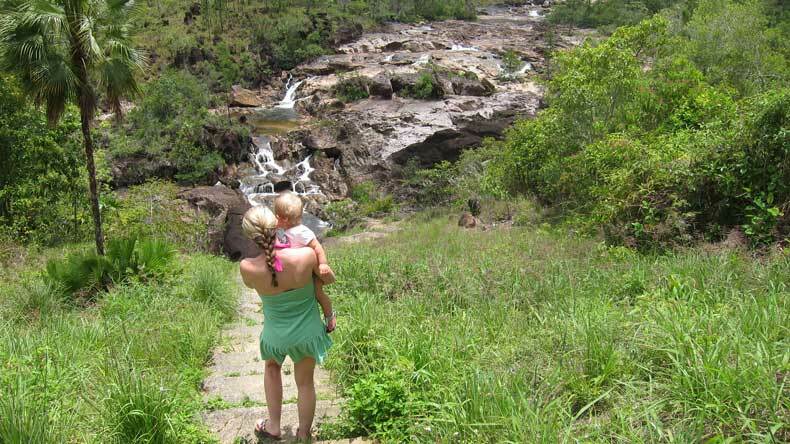 What differences have you noticed when traveling internationally with a baby or toddler abroad? Did you miss the conveniences of home? Leave us a comment and let us know your thoughts. Parenthood and Passports participates in the Amazon Services LLC Associates Program. This post contains Amazon affiliate links. This means, at no cost to you, we earn a small commission from qualifying purchases. Kudos to you for making it through. I think it is important for kids to travel because travel offers so much learning, especially at such a young age. I can only imagine how tough it would be. It’s already difficult to keep up with myself on travel, how much more with kids in tow! Our hope is that traveling will make our daughter a more well-rounded, tolerant and empathetic person someday. But you’re right, it is a bit more difficult traveling with a kid in tow. This is so true. We had an ordeal in Fuerteventura when we couldn’t get calpol in any supermarket (that is where you get it in the UK) until the penny dropped that it was in a pharmacy. Seems obvious now but it was a real headache until we solved it. We love traveling with the kids and have had so many wonderful adventures. These are important considerations. I found carseats to be the hardest thing to deal with. That stage doesn’t last forever though and worth the struggle! Thanks for sharing these important tips! I’ve never thought about the fact that so many bathrooms don’t have changing tables etc readily available, that really must make it tough. It sounds like there can be many challenges but its fantastic that you have found ways to make it work. Your daughter is very lucky to be travelling so much already. I guess I didn’t realise how many extra things you need to think of when travelling with a child. Great that you are able to give your daughter these experiences at such a young age. I’m not a parent yet but I might be one over the next couple of years! When I do, I’m sure I’ll come to your blog every now and then for tips & tricks! Good to know its relatively easy in USA! Too bad you didn’t find many changing tables in Europe! It’s really challenging to travel with little ones. I am not a parent yet but I have traveled with my sister and her kids. It was exhausting and fun. She has brought a lot of things because there are places with no changing tables too. I am not a parent yet but this was very interesting post for me. 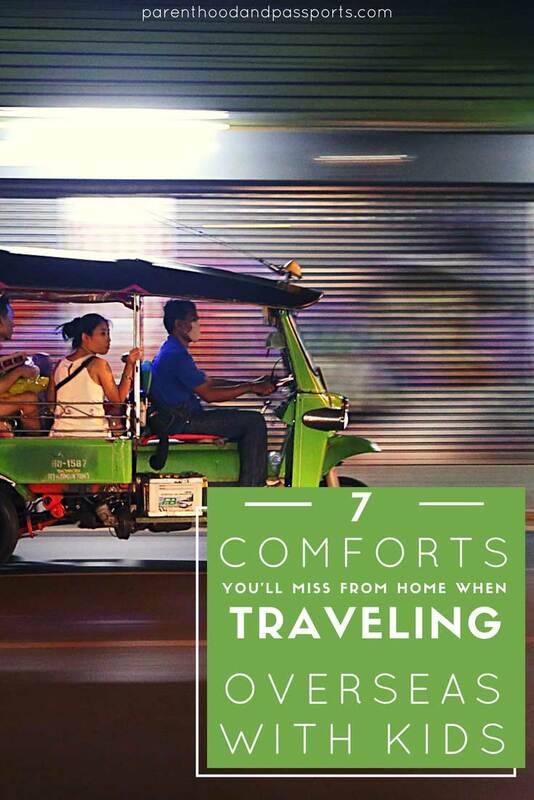 I have often noticed how mys sis-in-law compares these things when she travels to other places. In India too, there are not enough facilities with respect to traveling with kids. I am glad you are making the comparisons and making everyone aware. Great post loved reading about all these differences and I was able to connect so much with most of them! I’m guilty of the car seat issue though… ? Have never used one, we live in China and have travelled all over Asia, not once used a car seat when in taxis and buses…. I know it’s not the most responsible thing in the world but I guess I haven’t found a comfortable solution yet…. oh and about the bathrooms…. you’d be surprised at the AMAZING facilities in Korea and Japan…. and you’d die at some of the bathrooms I’ve come across with in China !!!! Oh!!! I want to know more! We head to China and Japan in early October. It will be our first time in either country. And yeah, we don’t use a car seat in buses and only occasionally have done so in taxis. But if we rent a car and stay awhile we typically bring or rent one.